Lifetime’s Drop Dead Diva has a ludicrous but slightly intriguing premise: aspiring model Deb dies in a car accident and is sent to heaven, where she accidentally gets sent back to Earth because she hits a “return” button. But she winds up in the body of Jane, a plain, zaftig lawyer (cue the scream from the show’s credits), who conveniently works at the same law firm as Deb’s fiancée Grayson. Yes, ridiculous, but this show also opened up some promising developments in the first season, as Jane/Deb had to navigate her new life in an entirely different body (in an early episode, she surveys her new brassiere and comments, “I’ve worn entire outfits with less fabric”). She now has to work as a lawyer (in another far-fetched but necessary plot element, her brain retains all of Jane’s previous legal knowledge) and she’s afraid to tell Grayson who she really is because he loved her as a beautiful blonde, but will he love her as Jane? The most problematic parts of the cast have been on the male side, especially the character of the guardian angel (I know), whose job is to guide Deb/Jane through her new life. The original angel Fred (Ben Feldman, who has since transcended to loftier cable pastures on Mad Men) had some appeal, as he also was trying to figure out life on Earth, and fell in love with Stacy. Since his departure, though, his followups (Carter MacIntyre as Luke and now Justin Deeley as Paul) have brought very little to the mix. They now seem like a shoehorned attempt to continue the Deb side of Jane. The other problem is the casting of Jackson Hurst of Grayson, who just does not command the kind of long-term devotion Jane seems to be set on. 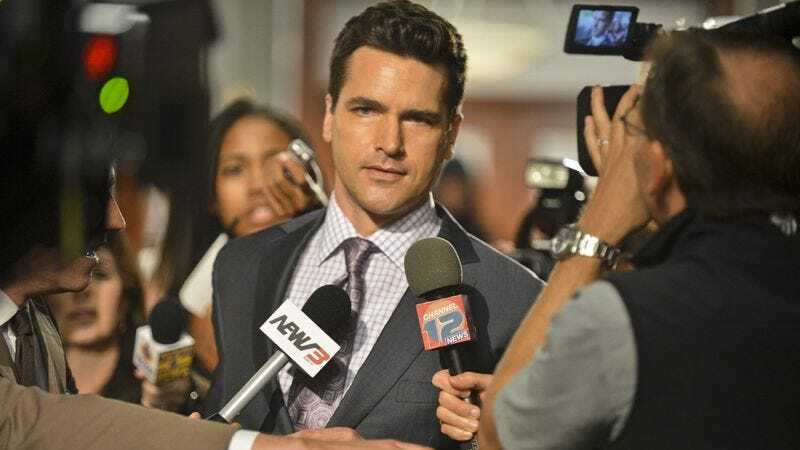 Besides Jane’s romantic trouble, this episode’s Case Of The Week is the kind that DDD does best: Grayson has to defend Kieran, a young man who got kicked off an airplane. He hissed at a flight attendant who tried to open his window shade because he’s a vampire, and the sunlight would burn his skin. DDD excels at this type of case, as it’s fun (vampires!) but then ties in to bigger issues, as Kieran was bullied as a kid and took on the vampire persona to get people to leave him alone. In the worst, most far-fetched storyline, Stacy has decided she wants to have a baby, and has asked Owen to be her sperm donor. As this episode ends, she’s pregnant, and she and Owen spontaneously kiss to celebrate. This is not a development anyone is looking forward to. In Jane’s big case, she appears to blow the case of a Paris Hilton-type socialite, but it turns out to be an elaborate legal ruse to get the socialite access to her trust, and get Jane to be partner. But the end of the episode finds her crying on the outside deck at her promotion party. Only her new angel Paul seems to get what Jane’s going through, as she’s still without her true love and her best friend is going to have her ex-fiancee’s baby (again, out of all of DDD’s outlandish developments, this has to be the worst). Paul reminds her how far she’s come: “A model who made partner, that’s something to celebrate.” But after five seasons, is Deb even still Deb any more? Isn’t she mostly Jane? And keeping Jane and Grayson apart after four and-a-half seasons just seems ridiculous at this point. The show would do well to wrap up these open-ended storylines and concentrate on the show’s main asset, which is Elliott, winning delightful cases of the week and showcasing a different size of TV beauty.